After completing the four bases of Ceorls so quickly it's been a bit of a disappointing week thus far with roughly only one base of Anglo Danish Huscarls to take their rightful place in the front of the Shieldwall. 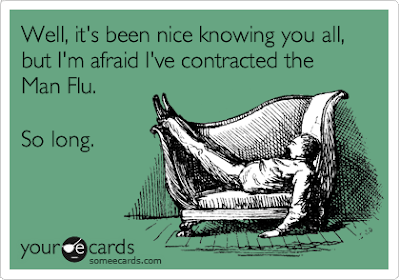 However, I'm not particularly perturbed as I've had a pretty bad dose of Man Flu (see below!) and that has slowed me down considerably, mainly due to my eyes watering so much that I couldn't see properly to paint! I've also made progress on the Command Base for Harold Godwinson which should be complete in a day or so, though one can add another couple of days onto that for the urethane gloss varnish and then Matting the mini's back down. The mini's that I've chosen are a good mix of old and new Gripping Beast punctuated by the odd Saxon Miniatures which were all pretty much sculpted by the same chap. I do have a few other companies to add, namely Crusader, Wargames Foundry(which will probably take up the large part of the Norman army) Drabant (thanks Andy- appreciated). My thanks go out to Darren for arranging many a moon ago now some special castings of much of their very old Saxon Range and some of their Viking range which are no longer available. Very very nice! Love the shields! Thanks Roger- hopefully get the rest done ASAP. Great looking figs! Nice job. I'm really enjoying this coming together.